Last year was quite an eventful one for the local housing market with strong demand and record prices registered in key property hot spots that included the Klang Valley and Penang. Concerns over potential overheating had culminated in Bank Negara’s imposition in early November of a maximum loan-to-value ratio (LVR) of 70% for third home mortgages. Buyers of landed properties in sought-after locations have benefited from good capital appreciation, with prices appreciating by between 20% and 30% year-on-year. Most of the home-buying activities were fuelled by cheap cost of funding and huge liquidity in the banking system. So, what is in store for 2011? Will home sales and prices continue to strengthen or will they sustain at current levels or start to head south? CB Richard Ellis Sdn Bhd executive chairman Christopher Boyd believes the prices of landed properties in the Klang Valley and Penang will continue to rise, supported by a strong economy, which will be spurred by heavy expenditure on infrastructure and other projects, and high commodity prices. However, the effect in Johor will be more muted because demand has not been so strong. “I believe the root cause of the strong growth in landed property prices in the Klang Valley and Penang in 2010 was a reduction in supply which followed the global economic crisis. Developers simply turned off the tap for a while until the future became clearer, and this is supported by data from the National Property Information Centre. “The economy and confidence soon bounced back and so the result was a temporary supply squeeze which of course will ease this year as developers increase supply,” Boyd says. As finance is still cheap and confidence remains high, he expects landed property prices to continue to rise in value, albeit at a slower rate. However, luxury high-rise residences in the Kuala Lumpur City Centre and Mon’t Kiara localities will continue to face a challenging market in view of ample supply and weak rental demand. He says the redevelopment of the Rubber Research Institute land in Sg Buloh and the Sg Besi airport has the potential to be phenomenal success and will benchmark Malaysia’s skill in producing large-scale developments of a very high quality. 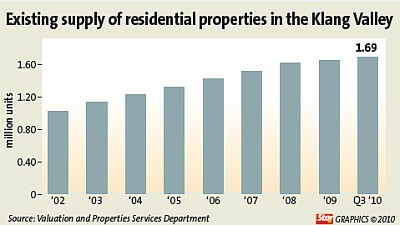 According to ECM Libra research head Bernard Ching, property sales and price appreciation are expected to moderate in 2011. He expects slower speculative demand due to the central bank’s LVR cap. Furthermore, the intense competition among banks in the mortgage market is not sustainable as net interest margins (NIMs) have compressed to very low levels. He believes that banks may have to raise rates and/or cease offering zero-moving cost mortgages to alleviate further pressure on NIMs. This will result in higher financing costs to housebuyers. On the outlook for the commercial property sector, Boyd says there will be further upsides in the office market, especially if the country’s economic recovery is sustainable. Boyd estimates a further 3.5 million sq ft of office space would be completed in Kuala Lumpur this year. He says it is more of a seller’s market right now as there is not enough investible buildings around to meet demand. Given the lower entry cost, demand is getting stronger especially for office buildings that are well managed and located, have high occupancy and good yields. “Similarly, the retail property sector is likely to strengthen slightly in 2011 with only moderate new supply and strong demographic of a young and growing workforce,” he adds. On the interest for commercial property, Boyd says that in the aftermath of the global financial crisis, while commercial rentals fell, the capital value of commercial property held up well. “The reason for this is that investors had become severely disillusioned with stock markets and were still prepared to pay competitive prices for income-yielding commercial property, so in fact yield expectations dropped. “This is a phenomenon that was seen all around the globe,” he says.